The Tehachapi-Cummings County Water District is conducting its annual pumping plant tour of a large part of its water importation facilities on April 18. The tour will leave the main office at 22901 Banducci Road at 8 a.m. and return around noon. 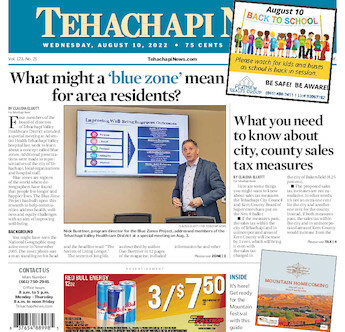 A free invitation to the public is now offered to see how water that serves residents, industry and agriculture is imported into the Tehachapi area. Contact the district office at 661-822-5504 to reserve a place by April 12. An accurate attendance number is needed to arrange transportation and a light lunch. Due to safety and liability issues, all participants must be 18 years of age or older. TCCWD imports water from the State Water Project and starts pumping water at the base of the Grapevine up the mountain to the Tehachapi area. The lift is more than 3,400 vertical feet, or two-thirds of a mile. This task requires a lot of engine horsepower, large diameter pipeline, millions of dollars' worth of natural gas and constant manpower. Every minute, enough water to fill a swimming pool is pumped up the steep elevation. The TCCWD team is always happy to have the opportunity to show customers the system and how their money is being used.